Yep, you are reading this right. It’s actually quite easy now to get Kindle books on Nook color and have both eBook stores available to you on a single device. This is possible because Nook Color is more of an entry level Android tablet than a dedicated eReader. As it comes out of the box it just happens to start the Nook application by default and not let users run anything else. However that can easily be fixed by rooting the device and enabling the Android Market. 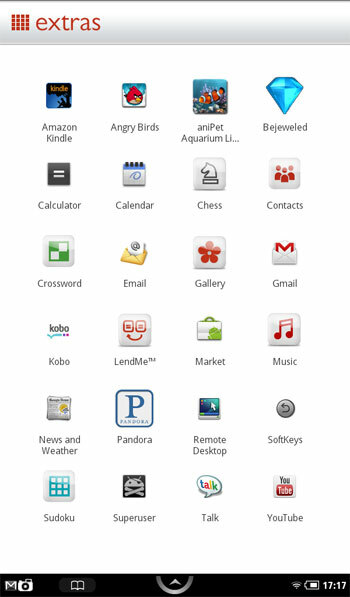 With Andoid market you can install all kinds of applications, including Kindle, Kobo reader. You would also be able to play Angry Birds and watch Youtube videos. 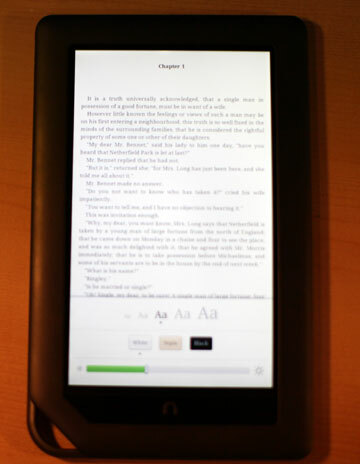 Installing the Kindle application for Android will let you read Amazon Kindle books on your Nook Color device. The downside however is that as with all hacks, you risk bricking the device and voiding the warranty. You may also lock yourself out of future updates from Barnes and Noble. So it’s a trade off but in my opinion a profitable one. It took me less than 5 minutes to execute all rooting instructions from NookDevs.com to root the device, enable Android Market, download Kindle for Android and have WhisperSync open the book I was reading on the same place I left it off on my Kindle device. SD card reader if your computer doesn’t have one. On Mac or Linux you can get by with tools that ship with the operating system. Before rooting make sure that you’ve registered the device with B&N as it might not work after rooting. On Windows use Win32DiskImager to write the image to microSD card (please note that all data on the card will be lost). For Linux or Mac, check out NookDevs.com for detailed microSD imaging instructions. Completely power off NOOKcolor by holding the power button until the screen blurs and “Power off NOOKColor” dialog appears. Select “Power Off” and wait for the device to shut down completely. 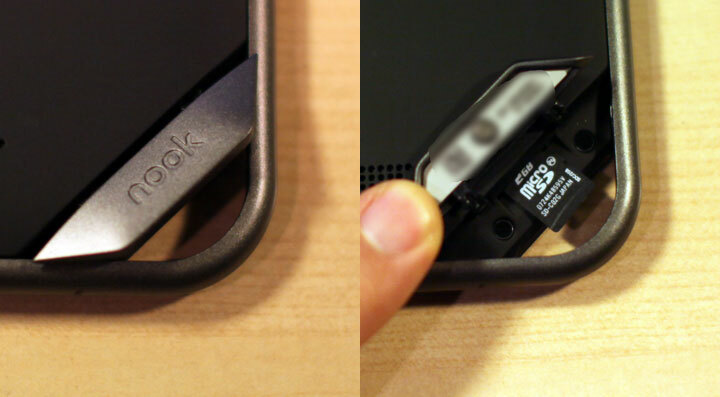 Turn device face down and open the microSD card container in the lower right corner. Push the card in with metal contacts facing down. Connect the device to your computer via USB cable. The device will power up and book from the SD card but the screen will not turn on. This is normal. After about a minute your computer show detect the new device. This means that the rooting is complete. Your Windows computer will complain about missing drivers. This is normal. Disconnect the USB cable and remove the card from the reader. Power cycle it by holding the power button for 20 seconds and then releasing it. The press the power button briefly to power the reader on. As the reader boots you will see a red splash screen. Once the reader boots, you will be prompted for you Gmail account (as usually with Android) and some initial settings. This will only happen once. You can now start the market app and download other apps that you like. You will need to reboot the device for apps to appear on the extras page. The apps themselves can be used right away just as with usual Android apps. After that the sky is the limit. First thing that I did was to download Kindle application and verify that it works – it did. See – for yourself. While this works, it’s not 100%. Initially I had some problems with apps not downloading via the market app. Reboot fixed that. Kobo app for android logs in and displays the list of books but then all books get stuck in “Waiting for download” state. Kindle app didn’t have such problems. I also tried Youtube, remote desktop, Gmail and Angry Birds and that worked well. All-in-all, I’m quite happy with this experiment as it shows once again that Kindle books can cross device boundaries and run even on competing devices. Does it add value to Kindle or NOOKcolor? I think both. If you have Barnes&Noble LCD eReader you can now get books from either store. Kindle opponents meanwhile have one less reason to complain about device-restricting DRM system. I wanted to do Kindle vs. NOOKcolor review first, but this post turned out more about how these two devices cooperate rather than compete. The comparison review will be posted sometime early next year. I promise. Some people claim that using NOOKcolor can be “unrooted” by “Settings” >> “Device Info” >> “Erase & Deregister Device” but I haven’t tested it yet. I’m quite happy with my rooted NOOKcolor. Another method is to hold power, nook and Volume+ buttons pressed until you are prompted for device reset. I’ve tried both methods and both reset the nook but apps were still present on the “extras” screen. The official 1.0.1 update got installed without problems and after rebooting all rooting extras were completely gone. I then went ahead to re-rooted the device and installed the Kindle reader apps back. This entry was posted in Kindle Applications, Kindle Color, Kindle Competition and tagged Android, kindle for android, kindle vs nook, NOOKcolor by Dzmitry. Bookmark the permalink. After you Root your Nook, can you still add .epub(s) and .pdf(s) via Windows Explorer and access them? I have not found this to be the case. If you can do it, please let me know how you did it. If I can’t access the data I had on the Nook BEFORE I Rooted it what’s the point? I can access my Amazon Kindle stuff on the rooted nook but not my B&N books. Or, from the pre-root nook I can access my B&N books but not my Kindle stuff. What a choice! And what about my .pdf(s) and free .epub(s) that I had loaded? I want to be able to do it all or what’s the point? This is a follow up to my Jan 24th entry. 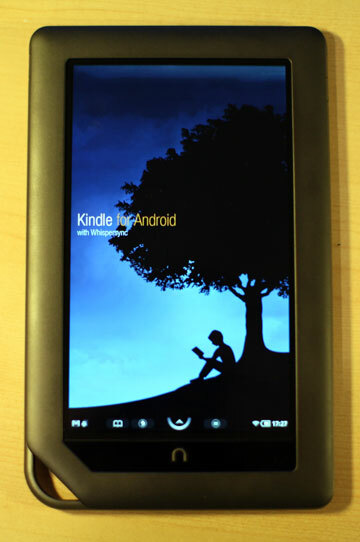 I am still very happy with the new android rooted Nook Color. I was able to get wallpaper/homepage by skipping the sign in (since it was already done anyway) and then go through the few options. Now, when I turn on the Nook Color, it goes right to the wallpaper I set instead of asking me to sign in every time. All in all, it is an awesome improvement to the device making it like a mini ipad. Thanks again for the android rooting instructions. My computer didn’t complain about missing drivers. I have the apps but kindle is not one of them. my google account doesn’t work either, it just goes back to the password screen even though I checked that the user name and password were correct. I’ll try again. I had Adobe Digital Edition on my PC to load ebooks checked out from my public library onto my nookcolor. It was able to move PDFs to the nookcolor. Using the usb cable with your nook color adds two drive letters to your PC. The first drive letter has the pdfs and books. On the nookcolor, touch “library” then the folders there seem to be the same as what you see on the PC under the drive letter. Elsa- I noticed this too, but when I just skipped the log in after the 2nd or third time that happened, it went on to the few settings then finished by pulling up the wall paper and then the log in did not show up anymore with each power up. I had noticed that I was getting gmail notices, and realized that it was working, just needed to complete set up with the “skip” button. Also, I am using the “uninstall aps” and “soft keys” aps to aid in navigation in and managing aps. OK, I am buying a nook color today. How do I get on the net. I dont see above on the rooted illustration like an internet explorer. Can I get on internet? ALSO, Can I do AOL mail? How likely is it that I am going to wreck this thing trying to root it? I am not that great at stuff like this. Installed Zeam launcher and now can manipulate the desktop and still chose anytime to launch nook UI. It keeps getting better and better. Kely, You can go on the internet in a wireless hotspot without rooting the Nook Color. Just go to settings and hit wireless and chose the signal you want to connect with (as long as you have the password or it does not need one). The rooting allows for downloading applications from the android market which is really cool since there are hundreds of free apps to chose from and hundreds of cheap (<$2.00) as well. Rooting also allows for changing around the nook desktop, choosing an alternate web browser (like dolphin browser HD which is a free downloadable app) and playing Youtube videos and other stuff too. I had little problem rooting mine last month and it just took a little while to get used to the new navigation. You may just want to keep yours un-rooted for a while and play around with it the way it is (it may be good enough for what you want/need to do). Later, you can do the rooting if you want to make it more powerful (I love mine like crazy now and it was not very difficult). Some people have had some problems, but mine were minimal and easy to work around. Oh and rooted or no, you should be able to get your AOL mail. One thing: Having a gmail (and/or) google account is needed to set up the Nook after rooting. This is a free service from google which you can set up on a computer before rooting the Nook. Good luck and feel free to ask more questions. By the way, I am not a computer expert by any means and I was successful with the rooting. Does it have to be a 128Mb SD card, can it be a 1GB SD card? Does Netflix work on nooted nook? Hi VeeS, I used a 16gb SD card and it worked fine. Vees- any size 128Mb or larger should work. I have not had success do far playing movies on my rooted Nook Color. I am not sure of its full capabilities yet. On another web site, which offers the same rooting instructions, it recommended a Class 6 or better SD card. Looks like you are having no problems with a Class 4 card. I have a Class 10 4 GB that I was planning on using. Do you foresee any problems with the speed of this card? Hi – great article but my nook is at 1.1.0. Will this work? I recently purchased the Nook Color with 1.1.0 and installed Auto Nooter 3.0.0 and it’s working well. Installed the LauncherPro to set up home screen and turned this ereader into a nice Android tablet. Waiting for Android 3.0 kinks to be worked out before root it. Thanks for the article. I’m a little disappointed with the visual aspect of the Kindle software for Android–mainly I want more choices to fine tune page and text colors. The Nook Color display screen is a bit harsh on the eyes after a while, compared to iPad or Kindle. Basically my eyes react well to something like a near black or dark grey page and light gray or beige or offwhite font. The Kindle software for Android has an option for black page and white font–on my Nook Color, the white font is too harshly bright for me even with the brightness level turned down. Other Android reader apps (Cool Reader, FBReader, and Moon Reader) have these options and are pleasant on my eyes. But they don’t read Kindle files, of course. On the other hand, I have a Kindle subscription to the NY Review of Books and it looks great on the “kindled” nook–suddenly the illustrations are in color! On Windows use Win32DiskImager to write the image to microSD card. Where do I see what class my sd card is? Any way to do this with a regular NOOK? Its the next day and my Nook received a software update and is working as a it was before. I am going to try to perform the rooting procedure again and I will let you know. Just tried again and the same thing happened. The screen remains black and white and the nook simble appears. I would surmize that they have found a way to prevent the procedures on this web page from working. I hope I am wrong. I just realized that, nothing will happen if I don’t have it plugged in. Unless someone can tell me what is happening, I won’t be trying this again. I have a pandigital reader will it work with that as well would love to have the access to apps. There is a way to change the language to my Nook? Is there an update for Version 1.2.0? I am running Honeycomb from an SD card on my Nook Color. Lots of apps work. But the Kindle for Android does not. Here’s what happens: I install the app, fill in the registration info. Registration works, but I immediately get a message Any ideas? I have a question regarding nooter. I have just updated my Nook Color to v1.20 (before I knew that I cannot buy any B&N books where I live). What nooter version do I need for v1.20? The nooter site gives *very* little information about anything. i have version 1.2.0 and the links to down load are not for this version does any one know which one i should use or is my version to new to do this. My Nook Color has software version 1.3 on it.Does anyone know if it will work with that version software on the Nook. Does this work for the Nook Tablet as well? I have software version 1.3. What can I do so i can get Amazon and Android apps on my ColorNook. The new software version 1.4 is coming out will it let you download Amazon? Well, I did what you said and now my color nook will not boot. It starts out “Read Forever,” goes to the nook icon and does nothing else but turn itself off. What now. Is there an update auto nooter file? Is there a way to go back? Everything seems to have worked fine except that I cannot find the Kindle app on Market on my Color Nook now. When I go to amazon.com and try to download http://www.amazon.com/amazonappstoreapp the app is blocked by my Nook and I can find no way to unblock it. Finally everything is working. My NOOKcolor software version was 1.4.1. I tried using “for 1.0.1 – GabrialDestruir’s auto nooter 2.12.25 file 25 Dec 2010.” That didn’t work. It wouldn’t boot as Android. I then used “for 1.0.0 – GabrialDestruir’s auto nooter 2.12.15 file 15 Dec 2010” AND THAT WORKED. I then was able to download the Android app for Kindle and everything is fine. I do wonder is there is a later upgrade for auto nooter 2.12.15. Help! I am following the instructions but I am having issues. Like Dave I too have V 1.4.1, downloaded 2.12.15 version of nooter went step by step but when I run the Win 32 Disk Imager I get a message “An error occurred when attempting to lock the volume. Error 5: Access is denied.” Does anyone know how to get around this? The SD card is not locked and I ran the Disk Imager as administrator. I truly appreciate anyone’s help. does this work on nook tablet??? my nook software is 1.4.2. will this rooting work with this software as well? I rooted a Nook for my mom. It was running software 1.3 so I upgraded it to 1.4 and used MN 5.12.20. You can get it here: http://www.mediafire.com/?x8b795ev0a88eav. Actually, this forum was really helpful in getting my nook rooted. I tried the instructions above and got bootlooped. So I found other instructions here: http://forum.xda-developers.com/showthread.php?t=1054027 thanks to whoever posted it before. You’ll probably want to go through these steps first to make a bootable SD: http://forum.xda-developers.com/showthread.php?t=987735. Super simple. And I’m not techie. Is there also a new nooter version for this software? Does anyone has a simple and clear ” howto root ” explanation, with the location of the new image file. I am not an expert in this stuff. You can buy plug-and-play sd cards on E-bay but they are very expensive. Try this one. NookDevs is the best place to go for all your Nook Rooting needs in my experience. Will buy a Nexus next time so that I can buy ebooks for Nook and Kindle. Would this work on a First Edition Nook or only Nook Color? Please, in the same manner, can I read amazon books in the nook simply touch (without color)??? ?